You know how sometimes an idea strikes at the most random moment? 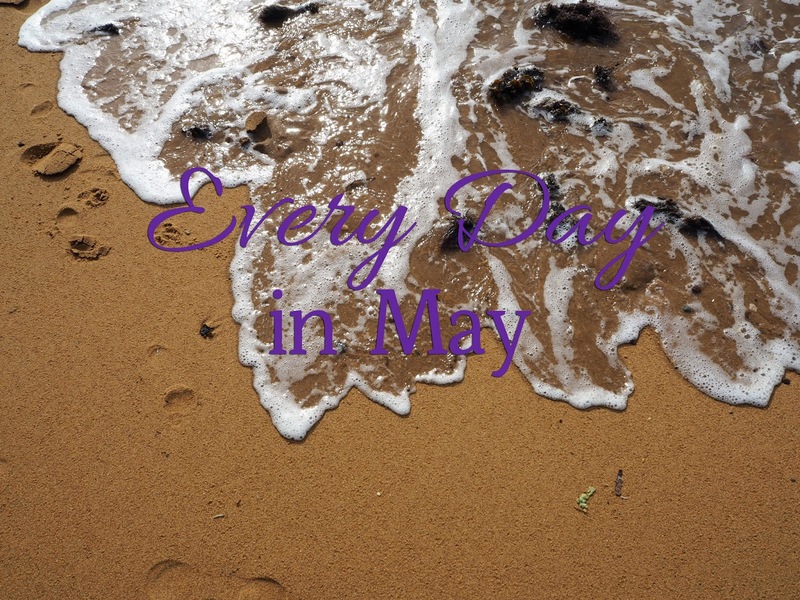 I was sitting, mindlessly scrolling through pinterest while waiting for dinner to finish cooking, when suddenly it occurred to me that the vague idea I had a couple of weeks ago to blog every day in May wasn't as silly as it sounded, and I could do it. If you'd like to do it too, here's the list of prompts, and I'll include a linky every day so you can link up your posts. Friday 1st your family, right now. If you've read here for a while, you'll know that each month I photograph each person in the house, and share a couple of good things and a couple of bad things about their right now. You can just share stories, but photos tell the story even better. Saturday 2nd what have you been reading this week? I spend hours every week reading, whether it's links shared on facebook, blogs, magazines or the current book club book. Tell me about something you've read this week, whether it's a book review, a magazine, or links from around the web. Sunday 3rd share a quote, and tell us why it's a favourite. I've heard people say that inspirational quotes have had their day, because they're shared so much they lose their meaning, but I don't believe that. Tell me the story of why you chose a particular quote to guide you. Monday 4th change the focus of your week by saying hello to Monday I shared last week why I say hello to Monday, this week I want you to give it a try - you can make it a to do list, listing the things you're going to do (or dreaming of doing), or a list of things you are grateful for. Wednesday 6th foods we eat. Do you menu plan, or fly by the seat of your pants each day? Do you eat the same foods over and over, or try new foods regularly? Thursday 7th top five movies of all time what movies do you have to watch over and over again, every time they're on tv? Friday 8th where do you go to clear your head? We all have that spot that makes us feel good when we visit, tell us about yours. Saturday 9th share ten bloggers you love to read regularly. Sharing links to other bloggers is a great way to say thank you to them. Sunday 10th what is the most important lesson your mother taught you? It's Mothers Day in Australia, so let's celebrate by remembering the things our mums taught us. Monday 11th say hello to Monday. This week, I'd like you to set a goal to finish something you've been putting off, and outline all the steps you need to take to achieve the goal by Friday. Don't forget, small steps make it less overwhelming. Tuesday 12th write a letter to someone. It's Chloe's birthday today, so I'm going to write my annual letter to her. Is there someone in your life you need to write to? Thursday 14th write a how-to post. It can be something useful, or tongue in cheek. Friday 15th what would you do with a million dollars? It's a pipe dream for many, winning the lottery. How would you spend the money if your numbers came up? Saturday 16th what have you been reading this week? Share your favourite links from the week, and don't forget to link up with the Ultimate Rabbit Hole linky. Monday 18th say hello to Monday share a recap of your weekend - any special activities, or just everyday activities? Tuesday 19th from the archives Time to brush the dust off again. Share the post you're most proud of from your archives. Wednesday 20th where I work Do you have a desk? Craft room? Shared work space? Share photos of your space, and what makes it uniquely you. Thursday 21st review your camera They say the best camera is the one you have with you. I believed that, until I got the Olympus OMD E-M10. I'm going to tell you all about it, but I want to hear about your camera too, your likes and dislikes. Friday 22nd share a recipe we all have that one recipe we could make with our eyes closed, we make it so often. Tell us the story of that recipe, and don't forget to link up with Fabulous Foodie Fridays. Saturday 23rd share ten pinners you love to follow We all have such varied interests, finding new pinners to follow is fun! Monday 25th say hello to Monday what are your goals for this week? Thursday 28th what do you collect? everyone has something that they collect when they go new places, besides photos and memories. What's your thing? Friday 29th what have you learnt this month? Blogging every day can be hard work. What lessons have you learnt? Saturday 30th share links to you in other places Sometimes as bloggers we forget to tell people about the other spaces we occupy. Today, tell your readers about your social media spaces, and any other places you can be found. Sunday 31st bake a cake You've made it to the end of the month. How do you celebrate the little things? Phew, that's a pretty comprehensive list! Does it sound like fun? Will you join me in May? Such an awesome list I'm going to join you and keep my posting going. Yay! Will be lovely to read your posts! Love the list so I might give it a go too!!! I've just copied down your list and have added it all to my journal! What a great challenge! I'm going to give it a go. i wonder if I'll be able to keep the momentum going through the month? Hi i stopped by i am going to try to blog everyday in May. I just got done with the A-z challenge and that was a lot of fun and now i am looking for another challange to take on. Looking forward to participating and meeting new people. Thanks for having and hope you have a great day. Count me in. Melissa's post was very convincing, so I popped on over here to check out your list. Yes, I want to play along! What a great prompt list! I don't have the capacity to blog every day this month, but if it's okay will be using some of your suggestions. Thank you! This is a fantastic list, thanks Cate! Think I might give this a go Cate - most of my posts usually require a lot of prep, photography, editing photos etc... So it would be nice this month to do a few where I just get to write and not worry about all the rest of it. I think that's the only way I'd be able to reach this goal! What a fab idea and list! I can't blog publish a post every day (my regular ones like restaurant reviews take too long to add others every day! ), but I will definitely use some of these ideas for posts :) Thank you! That is a really cool list! If I had the time everyday I would write! But even now writing, reading blogs, etc make me feel guilty though I shouldn't! There are some great blog suggestions in here. Good luck on your challenge! That is quite the list! There definitely is something for everyone!